A Friday off from work means a day of fishing. Being that I didn’t feel like heading to camp for bass fishing, I went to fish for trout and panfish. 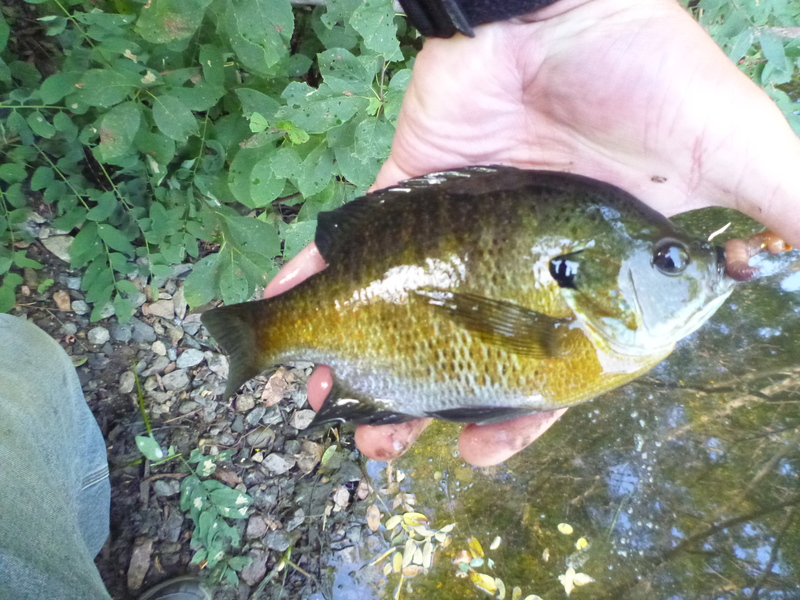 I fished a tributary to the Connecticut River for trout and in the Connecticut River for panfish. The day was hot but not too humid so the fishing was enjoyable. 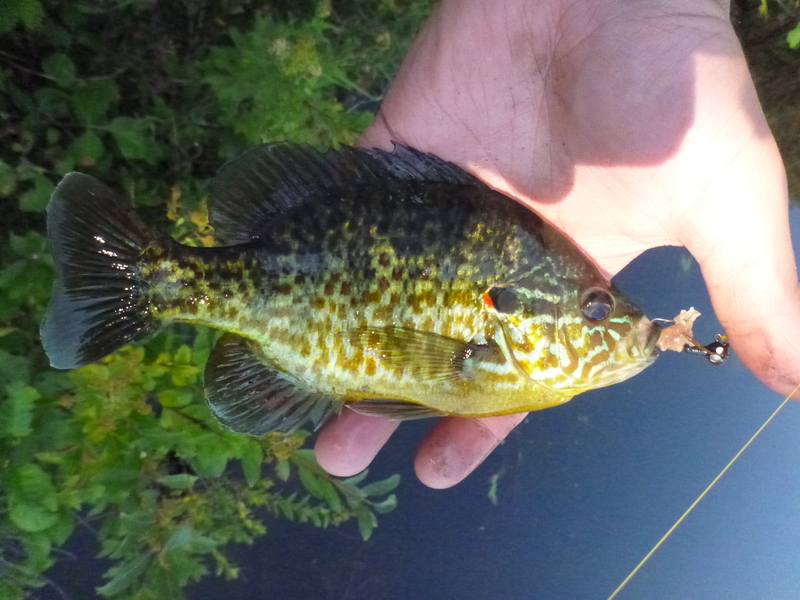 Check out Trout And Panfish on our YouTube page. 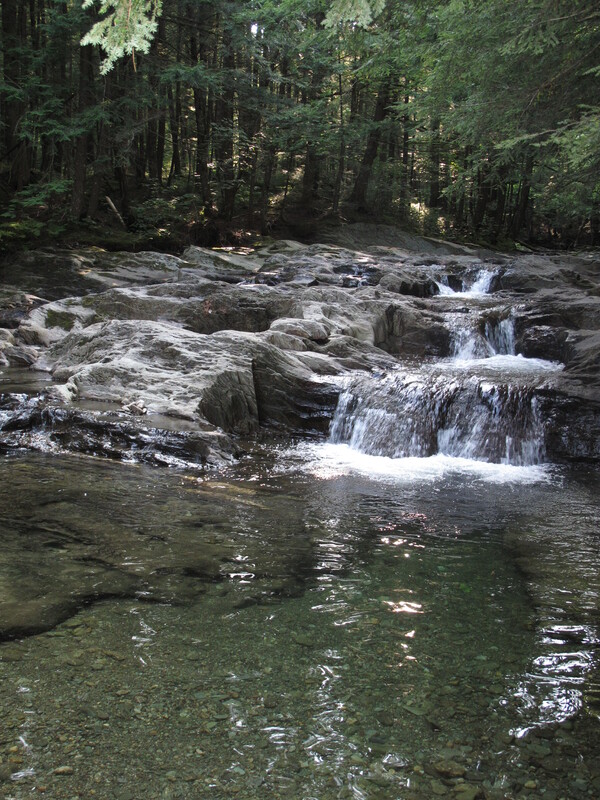 I first stopped off to fish a cold water trout stream high up near the headwaters. As I approached the stretch that I desired to fish, I saw a pool that looked like it was just stocked. 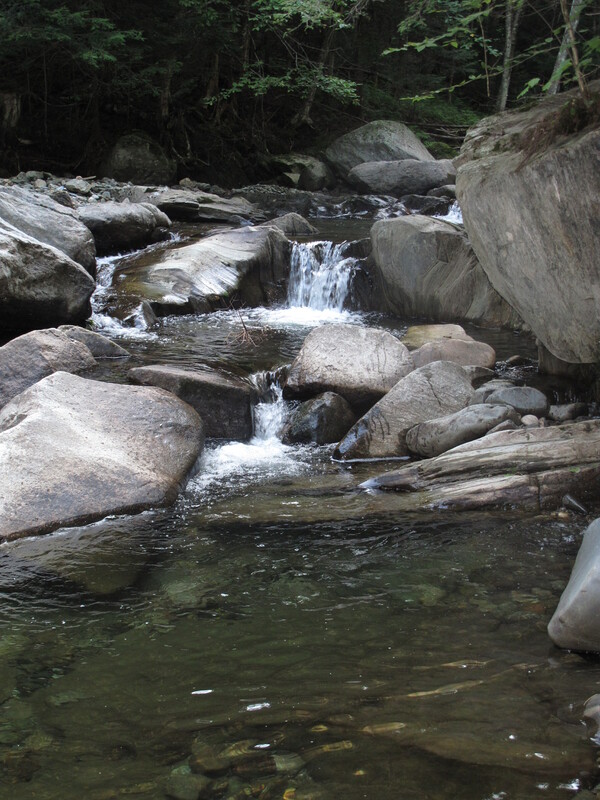 The best part is that this stream hasn’t been stocked with trout for years. 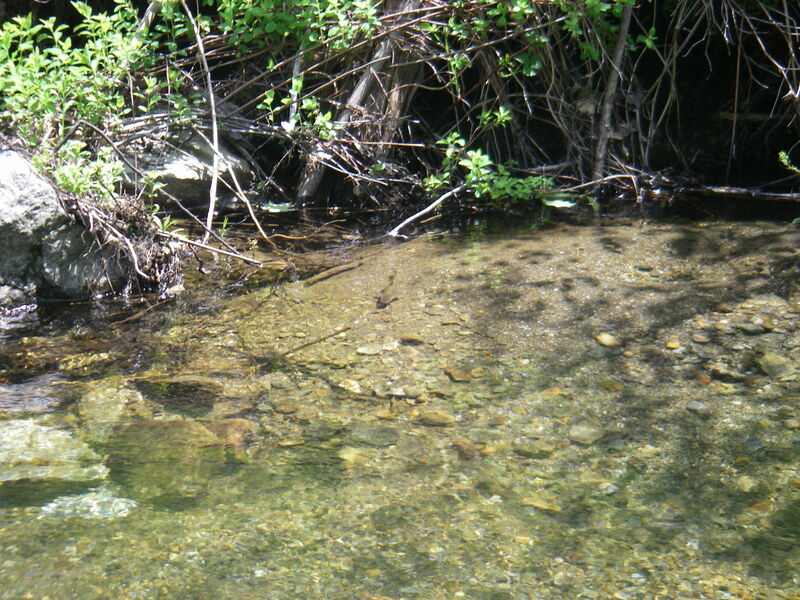 The big pool at the confluence of two smaller brooks was deep and clear and I could count well over 15 adult fish. 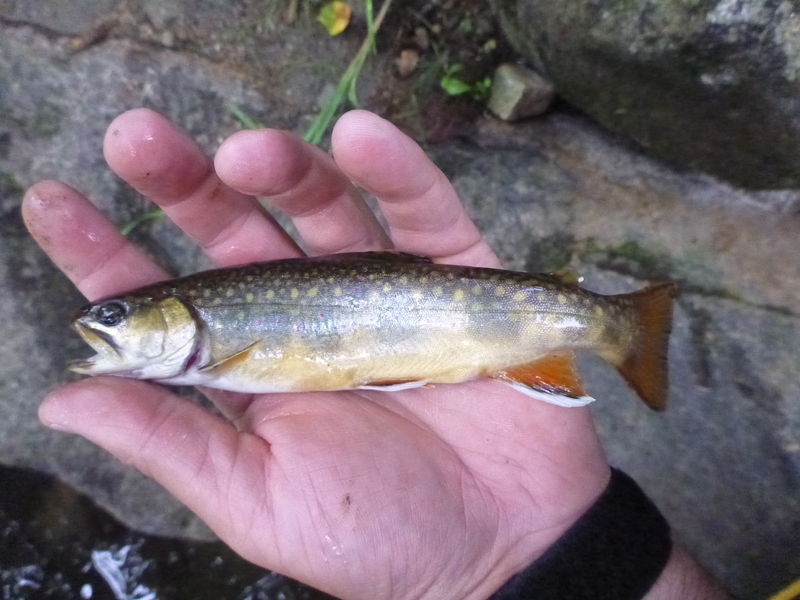 As I made my first cast, one of the larger brookies came up and smashed a fly only feet from me. I knew it was going to be good! I caught 11 trout and lost double that before calling it quits and heading to fish for panfish. 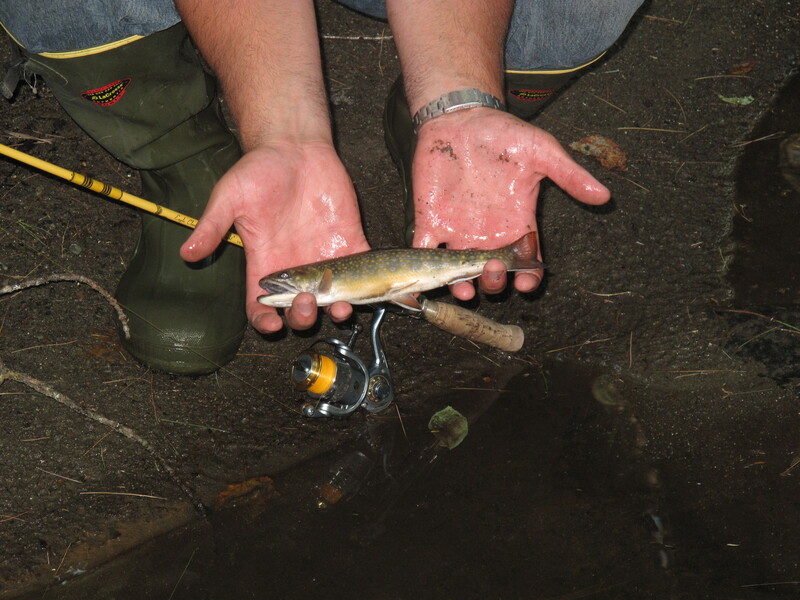 The fishing for me was frustrating because I had forgot my brook fishing tackle. I had no weight on my line so I was not able to get down into the depths of the pool where the fish were holding. My best option, which worked decent was to fish a small 1/16 ounce panfish jig right on the bottom. I caught several fish using this method and was satisfied. 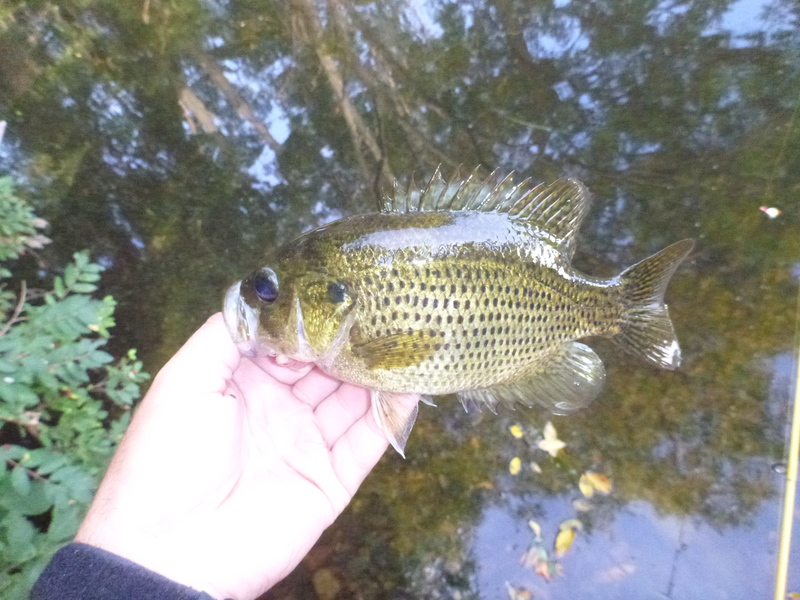 With a decent morning of fishing for trout, I was disappointed on the main Connecticut River when I was chasing panfish. Although I caught some rockbass and bluegill, the bite was slow. I worked hard for the two dozen fish I caught and none were that large. 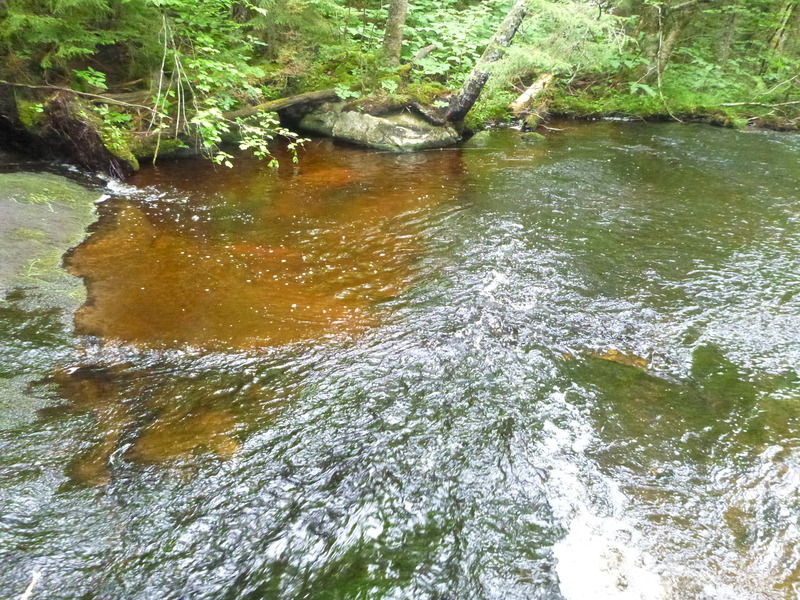 Dark colors were the best as the water was clear and high. 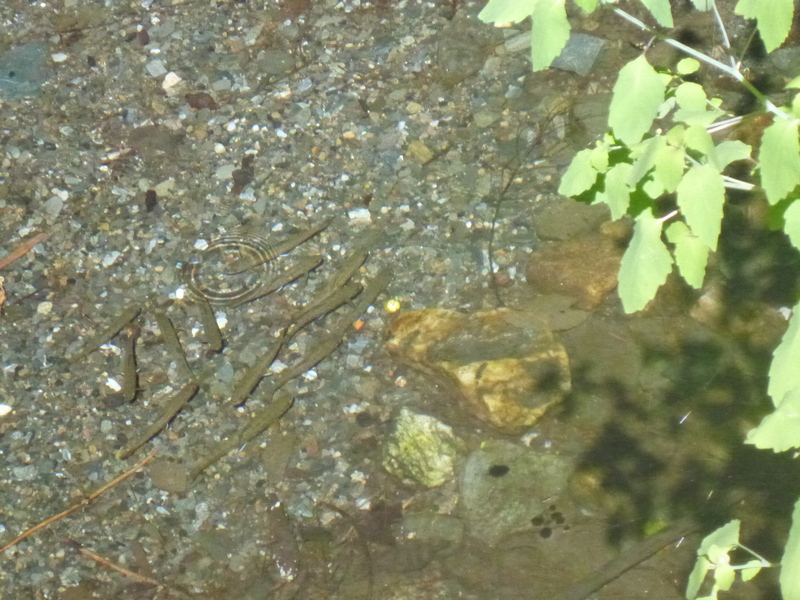 I found that the fish were holding very tight to structure or right on the bottom. I started off like I usually would by suspending a jig around 18″ below a pencil bobber. I caught no fish in the main channel at first but as I started to work close to the shore, I started to find fish as well as a large number of snags in the fallen brush. After losing more jigs than the number of fish I caught, I decided to switch up my thought process. I dropped my jig down to a little over 3 feet knowing how deep the water was from past trips. I found that the fish were holding in the deepest water available in the section of slack water. As I worked my presentation through the water column I started catching better fish but nothing with great size. I fished till about noon before heading home to get ready for work in the evening. After work today I stopped off at some waters that I frequently drive by while working. I figured it was about time that I gave them a shot as they look good! 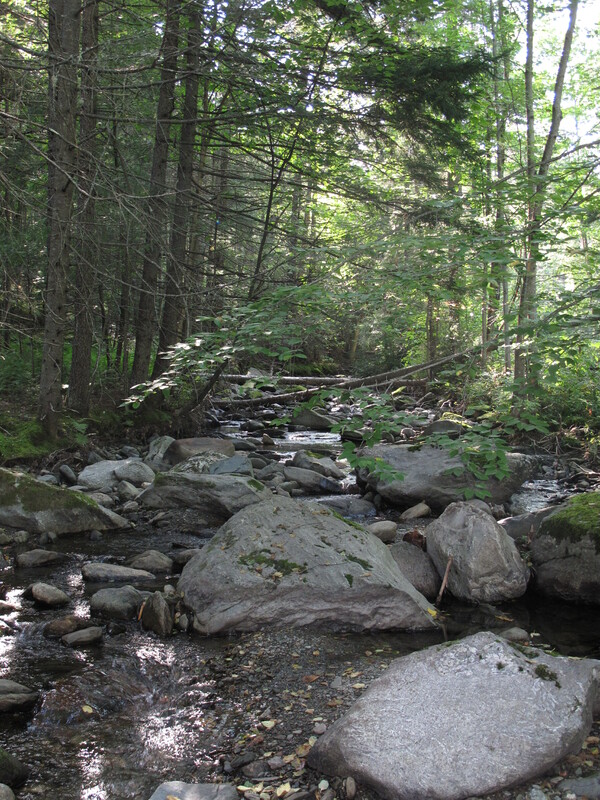 The smaller mountain streams in this area were hit hard by hurricane Irene about a year ago and have been slow to recover since. 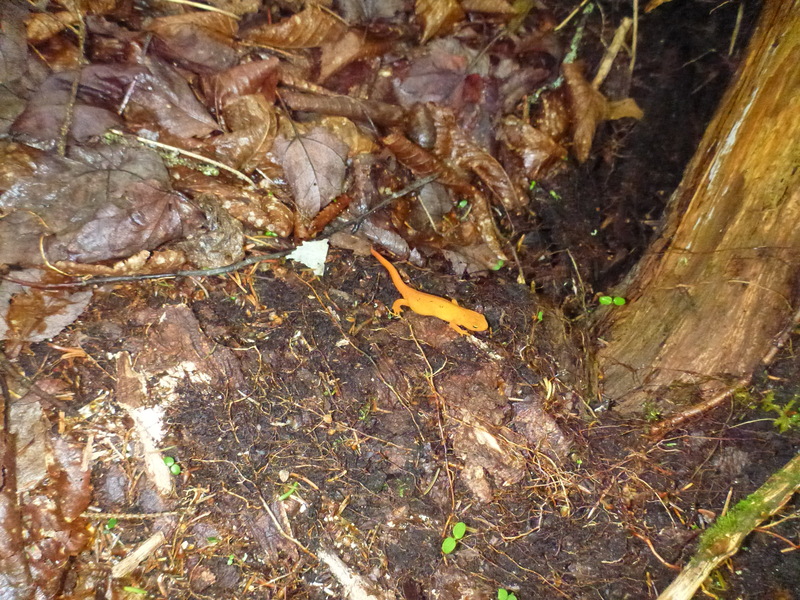 Usually flooding evens of any scale will create habitat in streams but this year we have had none. 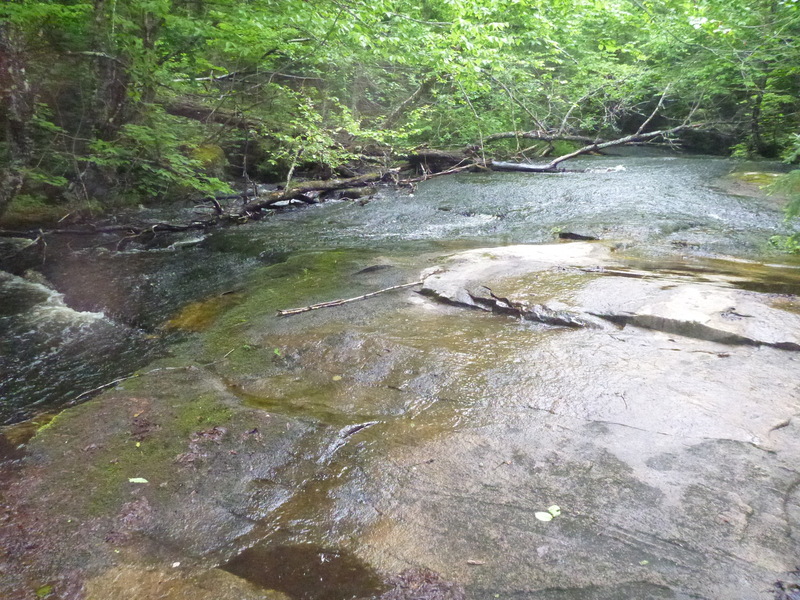 The streams I chose to fish are composed mostly of bedrock and large boulders so there was still decent pool habitat available for the adult trout. 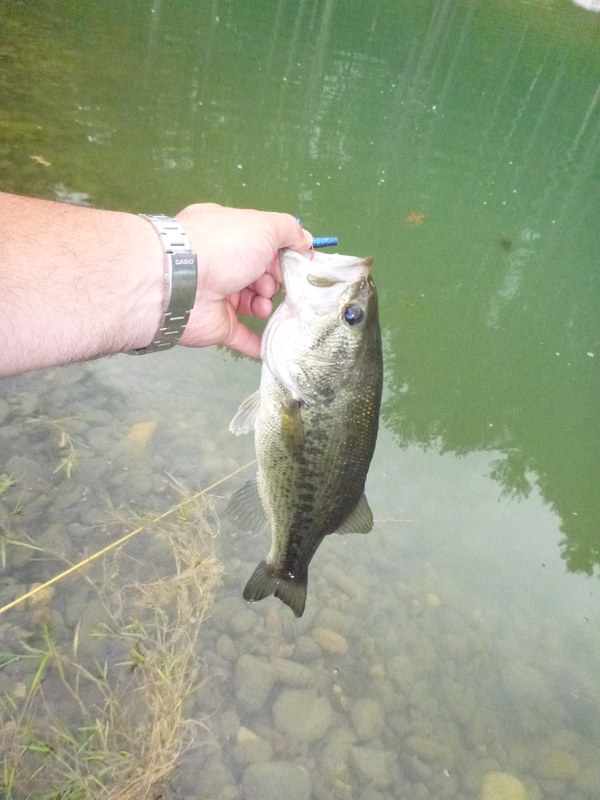 Although I didn’t catch great numbers, the fish that I aught were better sized. The fish were active and the water was very cold. I am glad that I wore mud boots! Being as dry as it has been this summer, I was surprised to see that the water levels weren’t that low. This was my best fish from the day and the sad part was that I caught the smaller of the two! Check out New Trout Waters on our YouTube page. You can see the pair of fish swimming in together as I reel it in (along with some other catches). 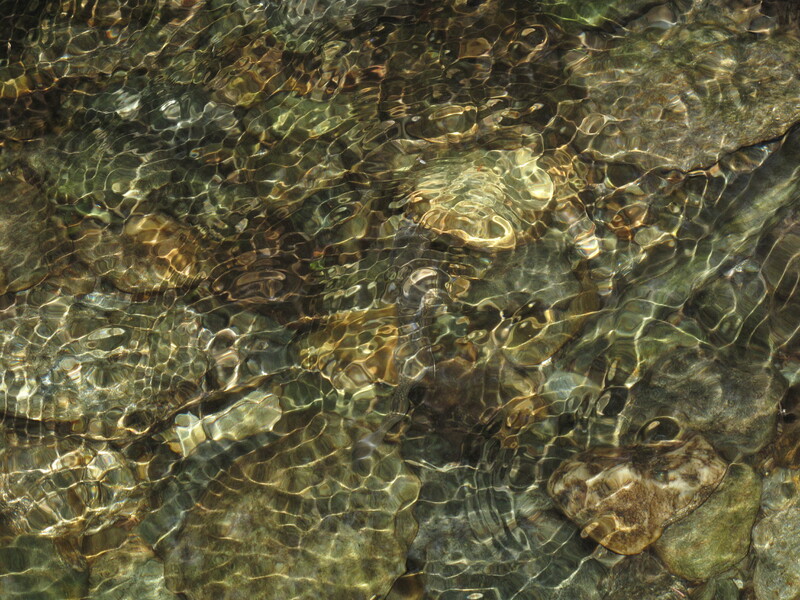 Can you spot the trout? 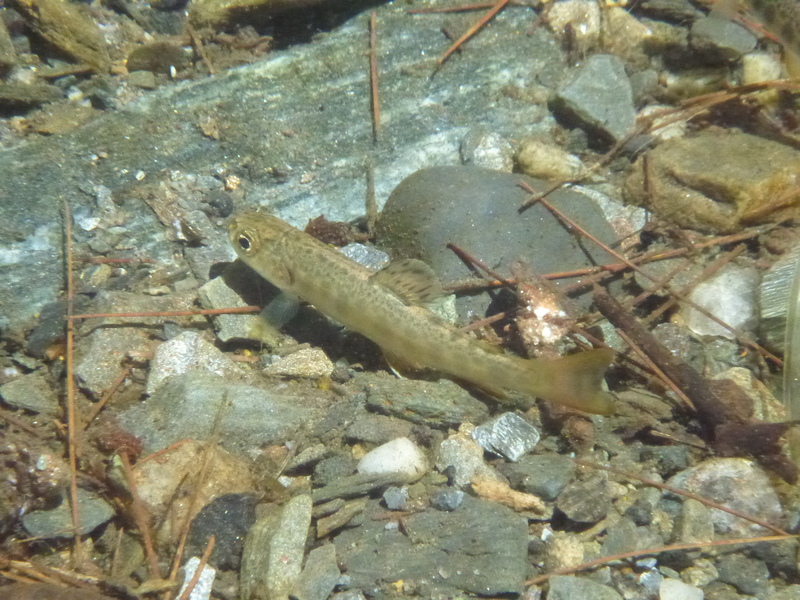 Even though it’s not a fishing report here are a few photos of some fish I have seen recently. 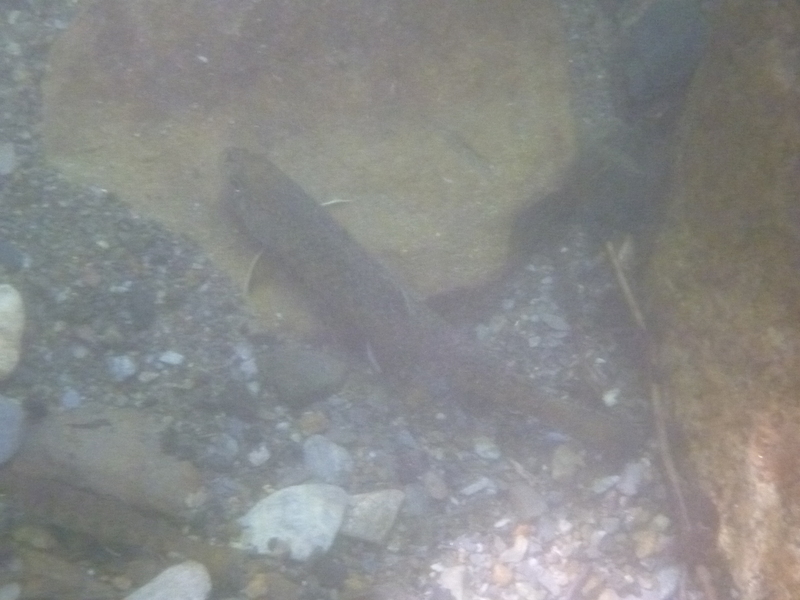 The heat doesn’t seem to be bothering the trout in this low water! Check out Non Fishing Fish Action on our YouTube page! On my drive to camp for the week, I decided to hit a few well known spots along the way. 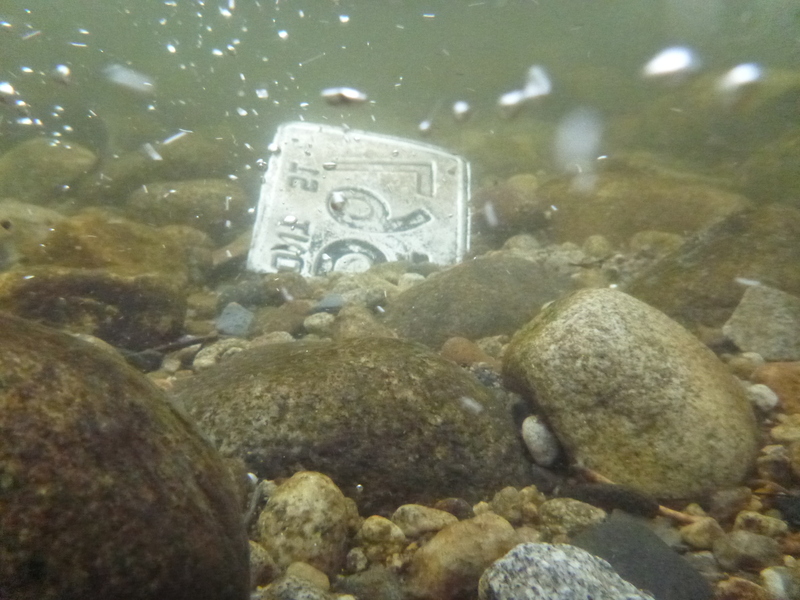 The water is still low so the currents were slower than normal but the fish are just as active as ever! The spots I was fishing were along main roads and are fishable by even a rookie fly fisherman but I was equipped with spinning gear. I was on my way to take my younger cousins out fishing for perch and pumpkinseed. I try to use barbless hooks, especially if fishing spinners. 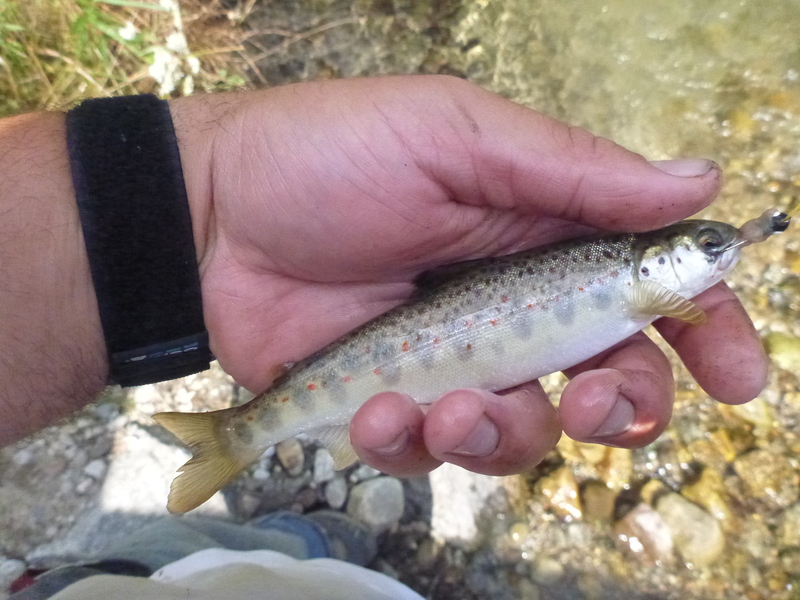 I don’t plan on keeping any of these fish so time and ease of hook removal is of the essence when releasing them. Because of the shallow water, I left my spinners in the truck and fished with a tiny split shot, snelled hook, and worm. The fish were aggressive and tucked into every pocket imaginable. As usual, the bigger fish were in the tail waters of the bigger pools where they were offered very good camouflage against the mottled bed rock bottom and best pickings at food. I caught a decent number of fish before I knew I had to leave as I knew my cousins would be growing restless waiting on me. Check out Community Hole Natives on our YouTube page for some footage from the day. 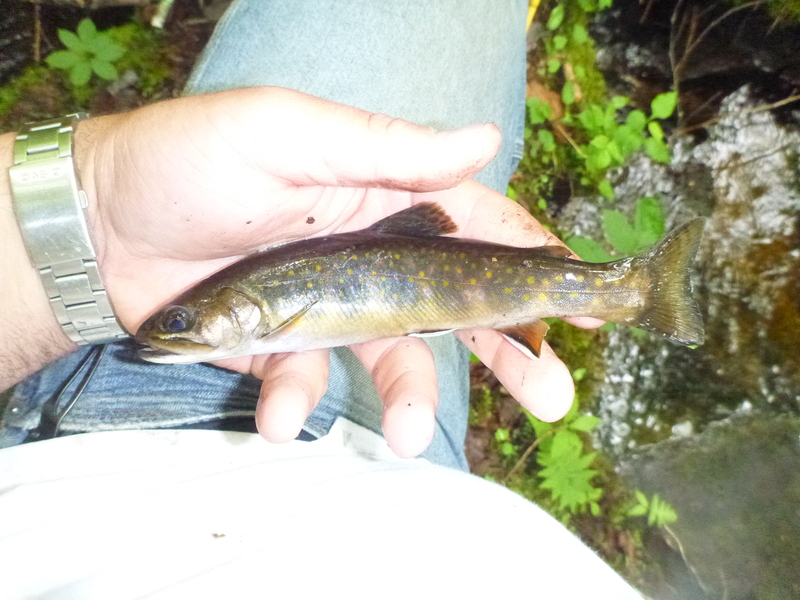 I got out fishing for some small water brook trout in the green mountains for a couple of hours. 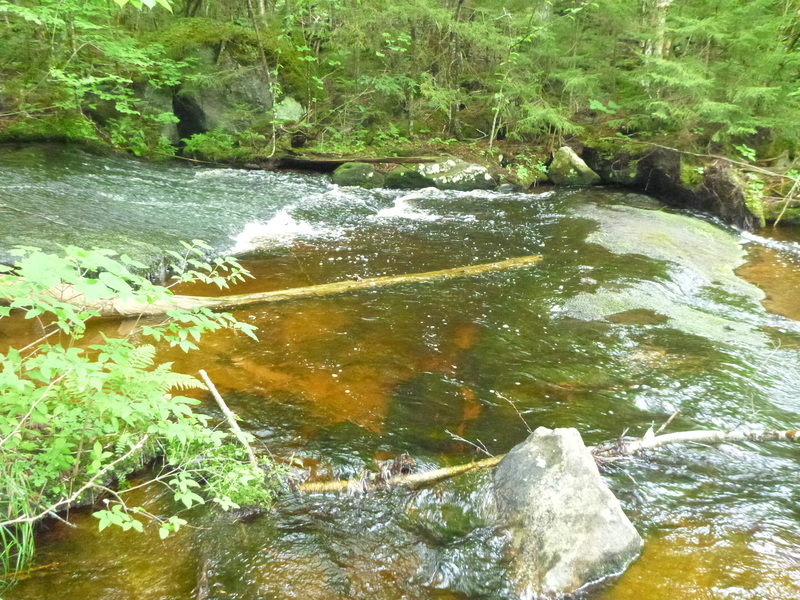 A few years ago, I was fishing this brook and catching very nice fish for the size of the water. Unfortunately, some people caught on to its quality and pounded it for a few days mid summer. The last two years I didn’t have much luck with size but the numbers have always good. Due to time constraints, we fished faster than I’d like and just a short stretch but we managed to catch close to 50 trout. The biggest was only 9″ but that is an increase from last summer. Check out the GoPro video on our YouTube Page. The trick to fishing these small waters is not to overlook any spots that might potentially hold a fish. 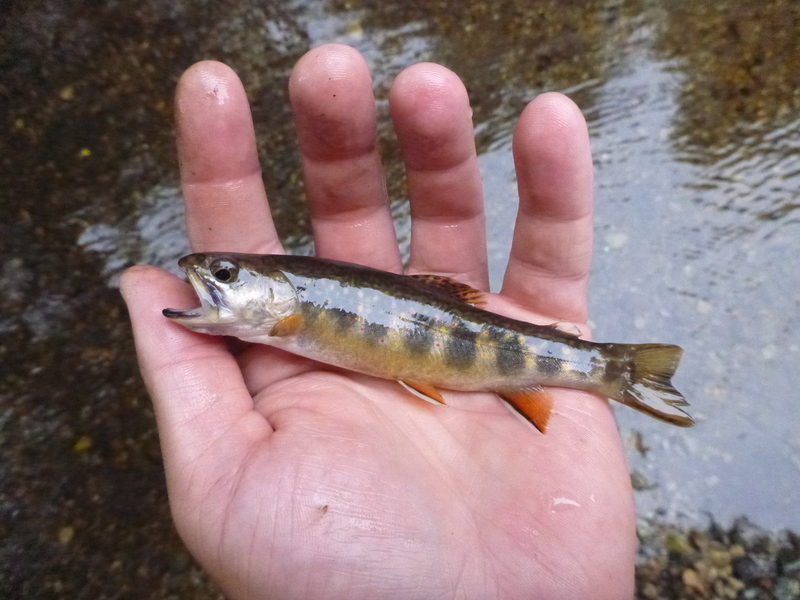 Most people I know like to fish bigger pools as they tend to be easy to fish and hold the largest specimens. 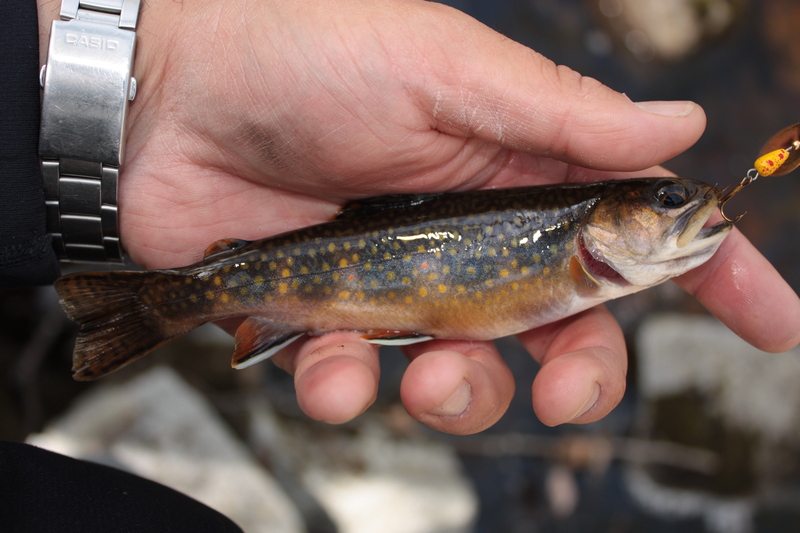 In general, these small brooks have the potential to hold a fish in every hole that offers some protection and especially if the water is deeper. I will drop my bait in just about every spot possible. 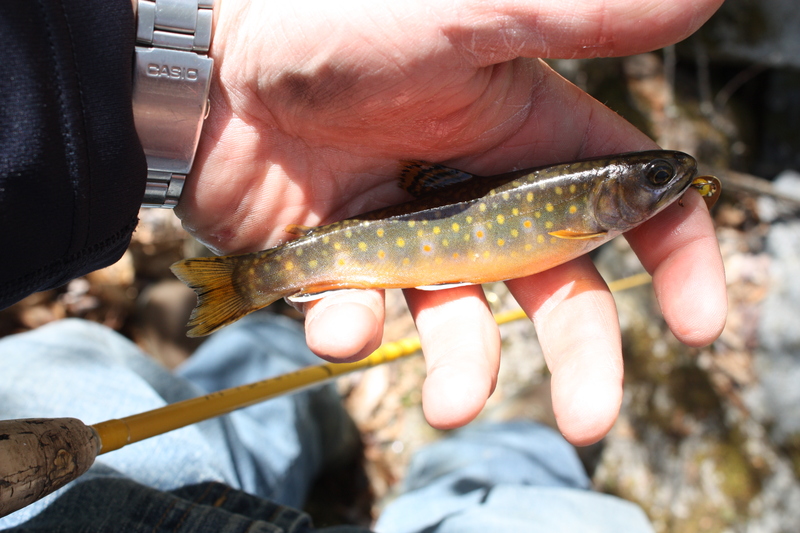 Brook trout feed aggressively, especially in these small streams, so most times if there is a fish near the bite will be quick. We fished worms for the entire trip. I like using spinners but treble hooks don’t always work well with their small mouths. I never seem to remember my fly rod either… Maybe next time! Here’s a few pics from the trip. At the upper end of the stretch we fished there is a nice bedrock slide. It’s a bit steeper and longer than it looks in this picture. Not to mention slippery! I even got to end the day with a few bass! A buddy and I made plans to head to my camp Wednesday after work in hopes that the warming water temps would be pushing the smallmouth up towards shore for the spawn. 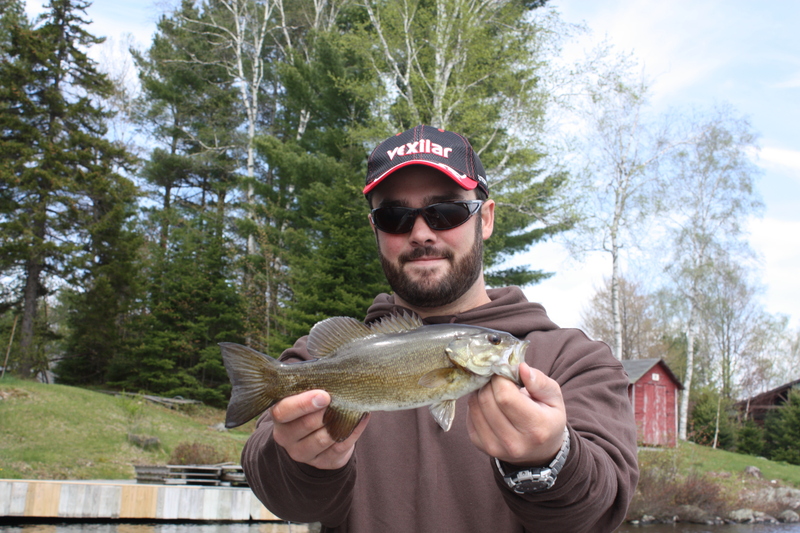 On a recent trip (Finally Put The Boat In), we found that some bass were moving up but overall only a few fish had made the seasonal migration. After a few more days, it was sure to be good! 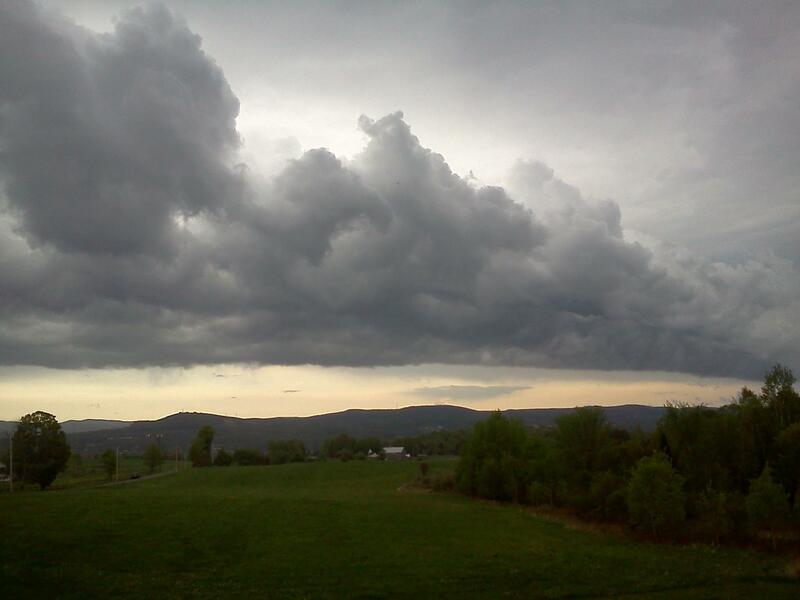 Mid day, the weather service began issuing severe thunderstorm warnings across the state but the skies were still blue and there was no wind. Perfect day for bed fishing! Of course, as I started on my way home, the skies as I crested the heights in Northfield were dark and stormy. We figured we had at least an hour on the water before the weather would push us off or sink the boat as we tried. Either way we were going fishing! It got worse than this after the next mountain range! We got on the water with clear skies above us but darkness on the horizon. The first few casts produced bites but we were still only able to boat a few fish throughout the day. The fish that were biting were right on shore but as we drifted along, we came across many beds in the 5-7′ depth range. Very unusual for the lake we were on from the years that I’ve been at it. I guess the lake needs a few more days till its worth going back again. We fished a good portion of the west shore as it provided the best seclusion from the wind and in past years has held more fish than anywhere else on the lake. Not necessarily the biggest fish though. As we went along with on our drift, the clouds crept closer and closer until we hit a point that opened us up onto the widest part of the lake. This was when we realized we needed to make a change if we hoped to get out of white caps and heavy winds. Not wanting to fish the same shore again, we went across to the south east end of the lake where the wind looked manageable. Boy were we wrong… We fished that stretch of shore faster than ever before. It was nearly impossible to effectively fish a cast with anything but a crankbait. As we reached the southern extent of the beat it started raining a bit. We called it for the time and started motoring back to the dock. The waves were splashing over the boat making the ride back not very enjoyable. After unloading the boat, we decided to hang close to camp in case the skies cleared. We figured the best way to pass the time was with some brookies. We fished two small brooks and a beaver pond with a few fish taking the bait. 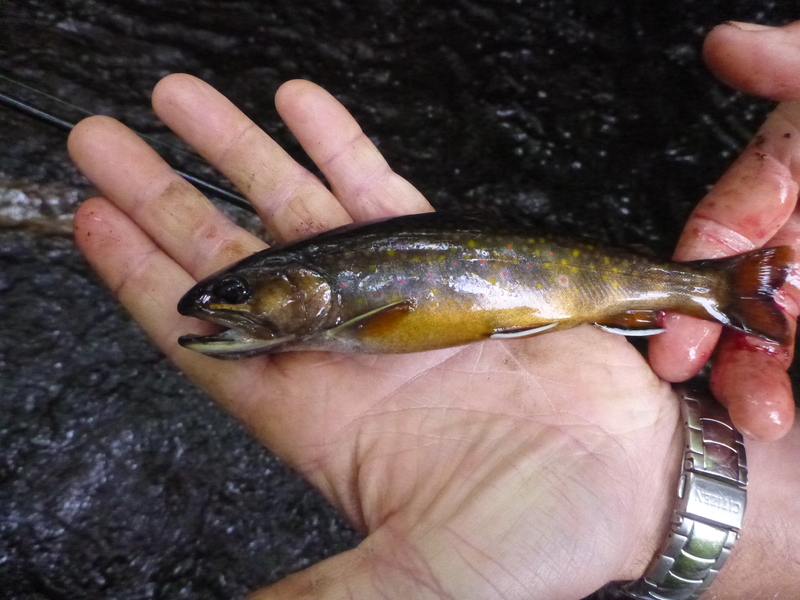 Native brookies have some of the best colors in the wild world! 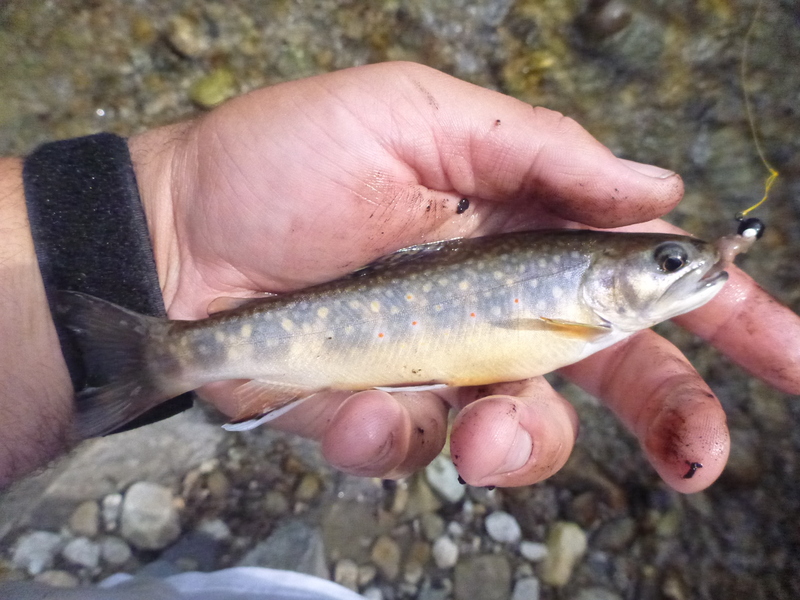 We posted a video of one brookie on our Facebook page. It was just after 7 pm at this point and we decided with the sparse thunder booms still lingering, we shouldn’t get back out in an aluminum boat! I knew of another smaller pond with bass in it on the way home so we beat feet there to look for some beds within casting distance of shore. We were successful in finding some beds that we could cast to. The first bed we found had two bass on it. One male and one female. We could tell there was both because they were doing a mating dance where the male was nudging the female in an attempt to release some eggs. It was pretty cool to see. I wish I had my underwater camera to try to get some footage of it! We were able to catch the male once. You can see a video of the bass on our Facebook page as well. Even with the poor weather conditions the day was still a success in my book! So after a few full weeks of working every day it was a nice to have a personal day. At least until 4pm when I had to go to my weekend job that is! I came across a few cool things since my last post. In the past two weeks, I came across seven license plates. Six were old and just one was a newer model. Here’s one of the better pictures I managed to take in the cold water before my hands froze. Opening day of turkey season I was heading out to my spot around 4:30 am. I had my decoys set up and was just about to sit down at 4:45 when a partridge flushed from right where I had picked to sit. It startled me pretty bad but I stayed for 45 minutes before realizing the turkeys had moved on to a new patch of woods. The following day I was passing by and kicked the grouse out again. With a quick peek into where she flushed from I found out why she was holding so tight. 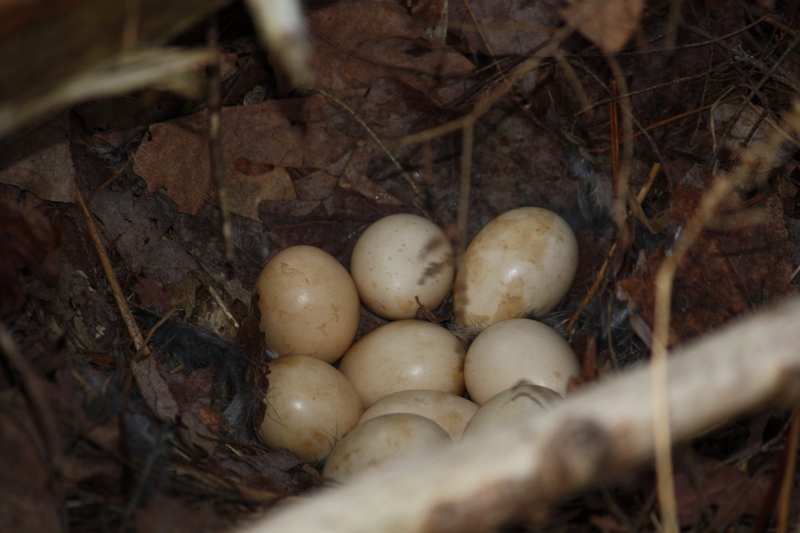 I snapped this picture of her nine eggs before vacating the area quickly in an attempt to not disturb her further. I returned the following day and she is still sitting on the nest so she must be fine with my passing by. I found a spot 75 yards away that I can watcher her from without being a threat. I will work on more pictures of her on the nest but its pretty brushed in. 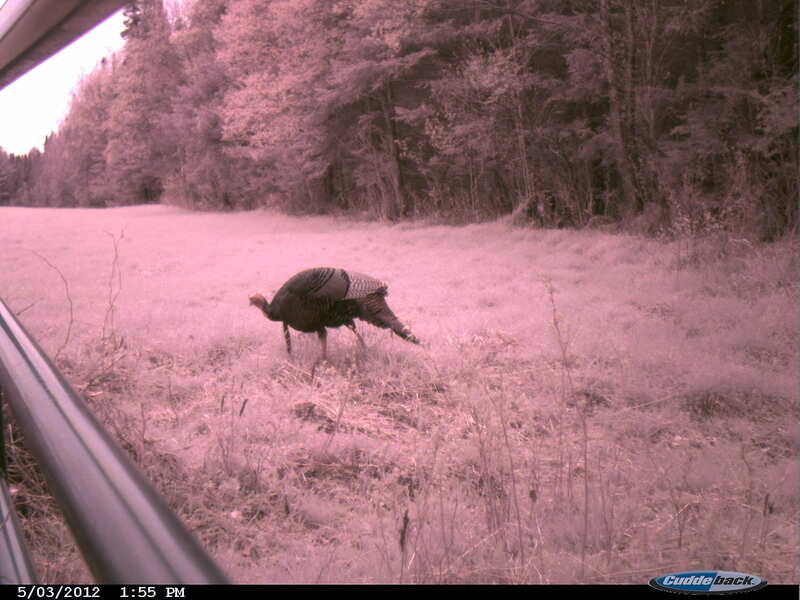 I went out turkey hunting this morning and had an unsuccessful attempt with the longbeards I have been seeing. I called in four hens but called it quits so I could finish up mowing the lawn before my buddy showed up around 11am to hit the water. The birds are there just not making much for noise so far this season.The quality keeps me coming back so hopefully I can connect one of these days! 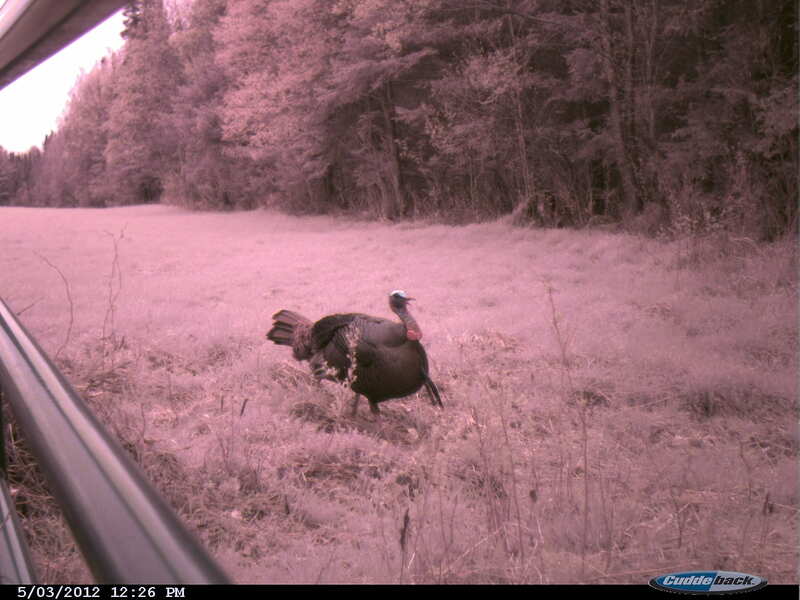 A nice looking double beard! Around 11:30 am, we launched the boat at my camp on rough water. 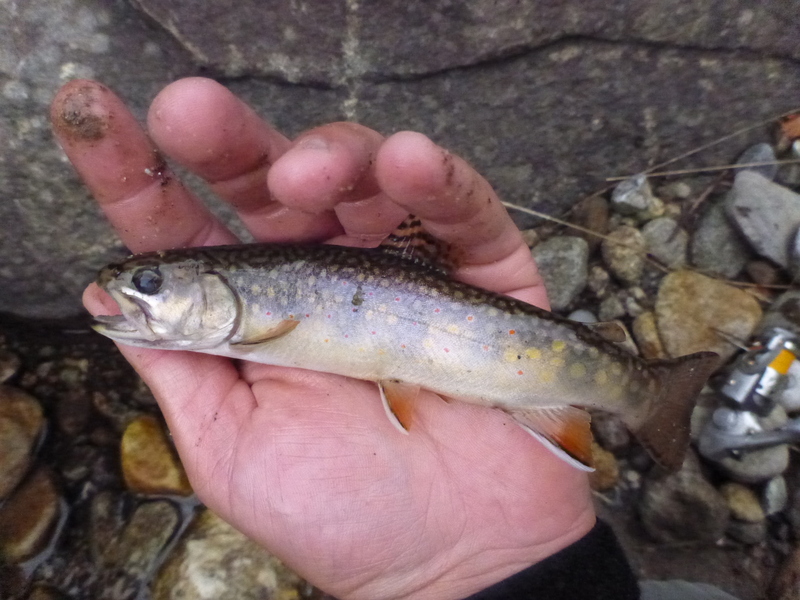 Days like today I usually skip bass fishing and go search for native brookies in the small streams surrounding my camp. Regardless, the time of year is just about right for the bass spawn so we shoved off after warming the motor up. The water temp is still a bit cold for the spawn but being mid-May it won’t be long till the beds are occupied. We drove across the lake trying to get on calmer water. The spot we began at was still rough but is usually a good early season spot for spawning pickerel. I figured if nothing else we would catch a few toothy fish as they spawn as cooler temps than the bass. As we were drifting in and getting our rods ready for the day we could see beds. We figured it wouldn’t take long to be on fish! That was unfortunately not the case. We fished a good deal of the east shore of the lake as it offered a slight break from the relentlessness wind. We went close to an hour without a bite before making a move to the north end of the lake and on the west shore. The water was much calmer which allowed us to fish slower and prime bedding areas. On the first dock we fished, I missed a bass. It got off with about half of my rubber worm after a few cranks towards the boat. I quickly re-rigged my presentation and began casting again. A few more casts at the same spot produced my first bass at camp this summer! Not a monster but it was good to be back at it! I’m sure I will have some much better bass to post throughout the summer. We managed to hook into a few more bass throughout the day but the bite was slow. Biggest fish was right around 15″. Hopefully the spawn isn’t over! Remembering that the fish on the Connecticut River were spawned out has me concerned but I think the time is yet come. We were off the water around 2:30 pm with the intentions of hitting a small brook for a quick pit stop on the way home. 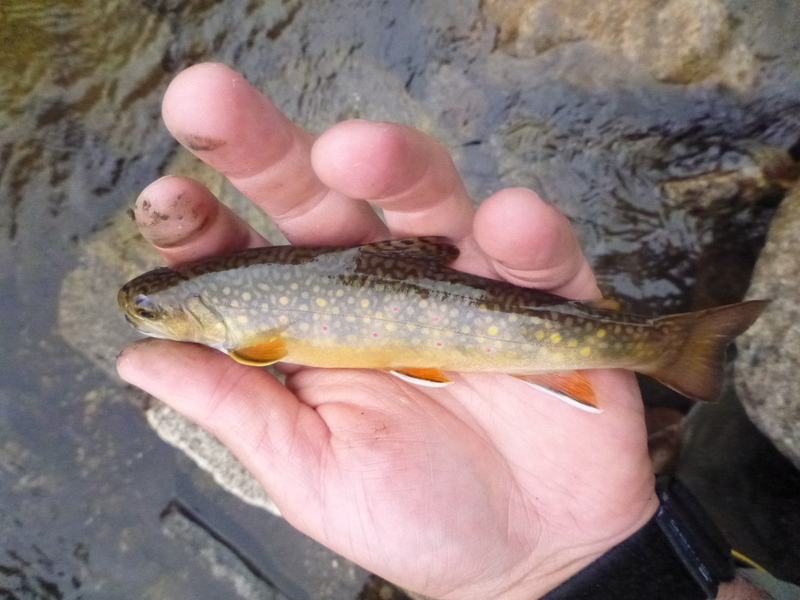 If you look back at a post back from early April titled “Scouting For Trout And Turkey“, I talked about how I had found some brookies cruising around in pools that I like to fish in the summer. One of the mentioned pools was where we hit today and it was still loaded. We either caught fish, hooked and dropped them, or had chasers nearly every cast. The water is clear to the bottom so we could see exactly what the fish were doing. Next trip out I’ll be sure to bring the GoPro and fly rod!